At Intelligentia we are always focused in the reuse of our technologies over different projects. For this reason we invest in the development, standardization, and documentation of frameworks and development platforms in order to have always a set of modules and components ready to be used. Frameworks like ELISA are the corner-stone of all our applications, created to hide the complexity of external technology evolution, they offers us the possibility to preserve an high level APIs to our applications indipendetly to the execution environment, database technology, programming language, and cloud solution. What if you plan to migrate your solution to the cloud in the future? All the products and solutions we develop based on our platforms, are ready for most used cloud containers (Docker, Amazon, Azure, Google Cloud). How to get a new information system developed and deployed in a short time? 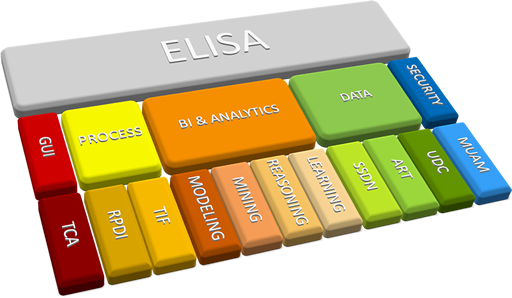 Intelligentia has an answer in Enterprise Light Information Systems Architecture (ELISA). Developed for being fully compatible with a Java Enterprise execution environment, ELISA is compatible with the most common DBMS (MySql, SQL Server, Postgress, Oracle DB, MongoDB) and also with in-memory database systems. ELISA is the corner-stone of all our main solutions. The main functionalities are related to the possibility to define with DSL (Domain Specific Languages) the structure of the data, the logic of the business workflows, and the graphical user interfaces. Visit the dedicated website to get further information about. ELISA is available under commercial licence. If you want to discover more about the product and its functionalities visit the dedicated website by clicking this box.